TSheets is an online labor and time management software program that can save your company time and money. It is an effective and easy to use time tracking tool. You can track time from the office or in the field with mobile compatible time tracking applications. Top notch customer support averaging 4.9 out of 5 rating (more than 1,000 reviews). What Problems Will TSheets Solve? TSheets gets rid of the issue of reading paper time cards by allowing employees to automatically keep track of their time in seven different ways. Employees can track their time with mobile apps for Android and iPhone, use Twitter to tweet their time if they work internationally, dial in time, text their time, use a smartphone with a web app for time submission, or track time on their desktop or laptop. Once the time has been tracked, the person in charge of payroll simply approves and submits it for payroll. No more illegible paper time cards to mess with. TSheets developed a crew app for iPhone and Android which allows crew managers to clock in multiple employees at the same time as well as assign them a specific task which makes creating cost and project reports easier. This crew functionality allows employee managers to identify how long it takes to complete certain projects as well as how much it will cost them in the future when bidding on new projects. 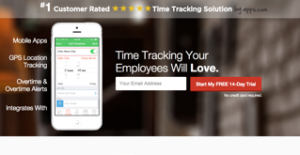 This is a great feature for any business that wants to track time for multiple employees at the same time. Companies are at risk of being audited or sued by employees who believe they were unfairly paid based on hours worked – TSheets eliminates the worry of being audited because its timesheets are DCAA and DOL compliant. TSheets allows companies to retrieve timesheet logs from employees to show exactly when employees clocked in and out, and includes GPS data if the feature is enabled. Organizations have diverse wants and requirements and no software platform can be perfect in such a situation. It is futile to try to find a perfect off-the-shelf software app that fulfills all your business wants. The smart thing to do would be to modify the solution for your specific wants, employee skill levels, finances, and other elements. For these reasons, do not rush and pay for well-publicized trendy solutions. Though these may be widely used, they may not be the ideal fit for your particular needs. Do your research, investigate each short-listed system in detail, read a few TSheets reviews, speak to the seller for clarifications, and finally choose the product that presents what you require. How Much Does TSheets Cost? We realize that when you make a decision to buy Time Tracking Software it’s important not only to see how experts evaluate it in their reviews, but also to find out if the real people and companies that buy it are actually satisfied with the product. That’s why we’ve created our behavior-based Customer Satisfaction Algorithm™ that gathers customer reviews, comments and TSheets reviews across a wide range of social media sites. The data is then presented in an easy to digest form showing how many people had positive and negative experience with TSheets. With that information at hand you should be equipped to make an informed buying decision that you won’t regret. Easy implementation and invaluable reports makes business even better. Never experienced such awesome support. Our company won big with TSheets. What are TSheets pricing details? What integrations are available for TSheets? Pros: I love how I'm able to operate on a number of reports and observe data from varying angles. I love how it's so easy to in time tracking jobs. Customer service has been great. I make full use of the chat functionality. Any issue that I faced was resolved within seconds! Cons: Editing functionality within the time sheet would be nice. That would make it more intuitive. Going for the micro pencil at the sheet edge isn't always simple to spot. Including a class code within the time sheets can be daunting. If not done correctly, it wouldn't be properly saved. Pros: They're willing to go the extra mile in helping me out! I felt I need help using the software. But one customer rep went online to inform me the more help is needed. So he referred me to another rep kept me to speed and assisted me all the way through. It's a good feeling to never be left out. Cons: Nothing much really. Although TSheets has some restriction on we approach in the calculation of OT. Since it's too complex to break down, I'll just say OT calculation is the only problem I've had so far. The pair whom I've dealt with were beyond perfect! Customer service was nothing short of excellent! A customer service event that's nothing but agreeable. If you need more information about TSheets or you simply have a question let us know what you need and we’ll forward your request directly to the vendor.